Viewing topic "WANTED: MOTIF DAW USERS"
Sorry for the dramatic title on this post but I really need a little education on how you guys use your DAW with the motif. Ok, I’ve always used the XF for all mixing, amd when I recorded into the Zoom, I did another mix and master. since the Motif has so many features, what purposes does recording your songs/patterns into a DAW serve? Do you record every track into the DAW? Do you use VST sounds in the DAW or the Motif voice banks? How do you route your ins/outs? In other words, is the motif your playback instrument versus PC? Any tidbits or practices that you’ve picked up would be appreciated. I’ve been saturating my brain with YouTube videos on FL Studio producer 12 and it’s coming together. I enjoy working with vocals but feel I’m missing something. Many years ago, fine print on one of the first ‘DAW’ systems from Alpha Syntauri went something like this: ‘Want to turn down the volume...?’No problem!’ it gushed. What followed was more than a dozen steps you need to take in order to do so. By the same token, when one prominent amp manufacturer disastrously dipped its toes into the world of keyboard workstations a few years later, the product manual for one of its litter of pups only finally covered ‘how to start a recording’ on page 120. Music tech has never had a good record when it comes to making products and technologies that are understandable by ‘normal musicians’ and that broken record is unlikely to be broken anytime soon. The very existence of this site is down to the fact that Motif, though clearly a powerful beast, was likely to be an impenetrably complex one to the average bear. Obviously a large chunk of the fault lies at the feet of manufacturers, who either don’t listen to the feedback from pro players they elicit endorsements from or simply don’t even ask them in the first place. Manufacturers also need to keep selling stuff so they like ‘feature creep’ because it makes good copy and keeps the commercial wheels greased. Well, maybe not absolutely and literally but there certainly aren’t any magic bullets or buttons when it comes to any DAW and any keyboard workstation playing nicely. They play, they can and have to interact to some extent. But they don’t play nicely. They simply are two different worlds and when they collide it’s less big bang and more big bummer. The moral of this ‘Sunday Rant’ is simply that the best approach is to make fundamental decisions about who’s the boss (two bosses is almost always a recipe for disaster), then set achievable goals (on which you can build slowly once stability has been achieved), and finally: focus on your music. Great music can and mostly is made using relatively simple equipment and simple set-ups. Not exactly what I was looking for, but interesting nonetheless. However, anyone with operational and practical experience wishing to comment on my questions, I’d be appreciative. I started out with multitrack tape recorders with MIDI synch boxes and later used Boss and Tascam digital multitrackers. I’ve always recorded vocals and instruments other than synths. I did a few experiments using the Motif sampler as an audio recorder but it was a compromise compared to an external recorder. I began using Ableton Live in 2011, use Cubase AI sometimes. Ableton is really easy to use and super flexible with audio but is weak as a MIDI sequencer, so I use it more like a MIDI-synched tape recorder. I mainly sequence on the XF and sometimes in Cubase AI. The main advantage of a DAW over a hardware recorder is that editing is easier and much more powerful. It’s much easier to use sample loops (for me, drums). MIDI editing can be easier but there’s things I can do in the Motif sequencer that cannot be done in Ableton Live at all...like FL, Live started as an audio-only program and MIDI support was added later. Cubase is the exact opposite, it started as a MIDI sequencer long before you could record audio to computers and the audio features were added later. Every audio track. When I do use Cubase, it’s usually for MIDI sequencing only so there’s no audio being recorded at all. Both. The Motif is the main source of sounds. I’ve tried to find VSTs that sound as good as the Motif voices and have come up empty. I use other hardware synths and VSTs as spice, creating sounds that the Motif can’t do (more purely electronic). I’m a bassist, so I almost always use either a bass guitar or upright bass rather than synth bass. Not sure what you mean. I use an iMac which supports multiple audio interfaces, Apple calls this an aggregate device. My FW16e is my MIDI interface, handles audio form the XF to Mac and the audio out of the Mac. A second interface with XLR jacks and phantom power is used for mikes, DIing electric guitars and any other hardware synthesizers. I’m interested in reading responses to this conversation as well. Thanks, Richie. MeatballFulton..........many thanks got me thinking a bit. If I play my XF sequenced song INTO the DAW, the DAW will not recognize the voice/patch names of course. So if i do any editing, say with drums, or perhaps a keyboard lick, i’ll have to route the DAW to playback through the XF, correct? FOr example, you said you use Ableton to edit your drums. Are you using a drum VST or do you just route your drum edited midi back to your motif? These are likely elementary questions, but i appreciate your patience. If you are using FL Studio, you should use the VST Editor. This will let you set the mixing for each recording project. When you reload the project the editor will restore the mixing settings for you. I hate sequenced drums, they sound like crap. I use sample loops, audio recordings of real drummers. You can use sample loops inside the XF (or any Motif with RAM) but if you want to make a tempo adjustment, it only allows this by percent not a raw tempo number. Let’s say the loop was recorded at 130 BPM and I want my song to be at 115 BPM. I can’t get precisely 115 using percentage. 90% would be 117, 89% would be 115.7, 88% would be 114.4. Ouch. In Live, I can drag the sample to an audio track, set the project tempo to 115 and the sample will play at precisely 115 with no problems. It’s not a VST, it’s an actual piece of audio being loaded into an audio track inside the DAW. FL Studio is based around this concept, too. Both Live and FL (originally called Fruity Loops) were designed to build up songs by looping samples, the way hip-hop songs are produced. MIDI sequencing and VST instruments were added much later to both. Yes, once you have recorded MIDI into FL you do all your editing there until you’re finished and FL will play the parts, not the XF sequencer. Ok, I’ve always used the XF for all mixing, amd when I recorded into the Zoom, I did another mix and master. I’m isn’t a USB connection now to the PC (Windows ) since the Motif has so many features, what purposes does recording your songs/patterns into a DAW serve? You don’t say which motif you have which has some bearing on what you can and can’t do with a DAW. For myself, I’m generally using the motif as a scratch pad and then saving the song as a SMF(standard midi file) and opening that in Logic to fix my dodgy playing ! Sometimes I’ll then save that file back to the motif or carry on in logic using the motif as an “external instrument” which can route the outs of the motif through the sound card into the logic mix bus. This is limited to 4 mono channels or two stereo though i.e. 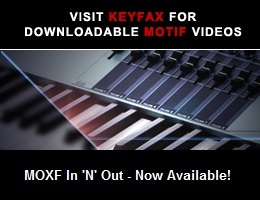 the motif main and assignable outs. This allows a direct mix down (from logic) without having to bounce the tracks individually. I’m pretty sure FL would have a similar function. That said, its a bit hampered by having only four channels (but currently yamaha are the only company who offer more). If you’ve got the motif XF, you can get the firewire card (although on PC you will probably also need a third party firewire interface) and this effectively replaces the ZOOM and routes 16 channels from the motif direct to the DAW. So I think the main driver behind using a DAW is to add things from outside the motif world i.e. live instruments, vocals etc. into your productions. On the other hand, I have recorded vocals straight into the XF and whilst being tricky to work with, it does sound very good. I’m contemplating getting a flashboard so that my recordings survive a power off without having to save the audio externally to a usb stick. As for patch names, in logic there’s an area where you can paste the names copied from the motif manual into the appropriate logic banks and the bank and patch selection works from logic. There are a few guys who have put template files up on the net with this so there may be one for FL already existing. Also interested in this topic, thanks for sharing. FL Studio is one DAW that can. Others are Cubase (doh), Reaper, Studio One. Ones that cannot use the VST Editor include Logic (AU only) and Ableton Live (VST2). The VST Editor communicates with the XF, puts it into Song mode and creates a mixing. The editor loads all the voice data from the XF and allows selecting them by bank or by category, just like on the XF itself. It does not save the mixing to the XF, so nothing is overwritten. When saving the DAW project, the state of the editor is saved. When the project is reopened it sets the XF mixing back to what it was when the project was saved. The user has the option to load all the voices back into the XF to guarantee any voices that were edited inside the DAW will be present in the XF when playing back the song. If the FW16e is installed, the editor can route the audio into the computer but if not the USB connection will still control the XF voices and mixing. All that is needed in that case is to route the XF audio into the DAW through an audio interface. Each track in the XF mixing always represents one MIDI track in the DAW, the number of audio tracks used is up to the user. I began this thread with a blurb about how new this was. Your last post and explanation offers me more insight into coordination between the XF and DAW. I’m trying to get the VST to communicate with the XF. I had a number of posts I an FL studio forum that had me adjusting various ports and other issues with sysex stuff. Along the way I started getting a message in the VST indicating a missing or some kind of port issue. I believe the XF and Studio can only communicate with port 4, as port one never connected. When using the XS or XF with a DAW connecting port 1 is always required, the other three are optional depending on your application. In Richie’s case he should have ports 1 and 4 connected to FL Studio. When there’s confusion over ports, I usually suggest running the MOTIF XF Editor Standalone/VST initially in standalone mode. It’s often easier to understand port assignment when dealing with only the Editor. Once that’s working correctly, you can move on to integration with a DAW and determine what that requires.